Today we are introducing our brand new gold mobile bar which is a super-stylish, professional mobile bar, unique and exclusive to Event Hire UK, perfectly suited to weddings and corporate events. 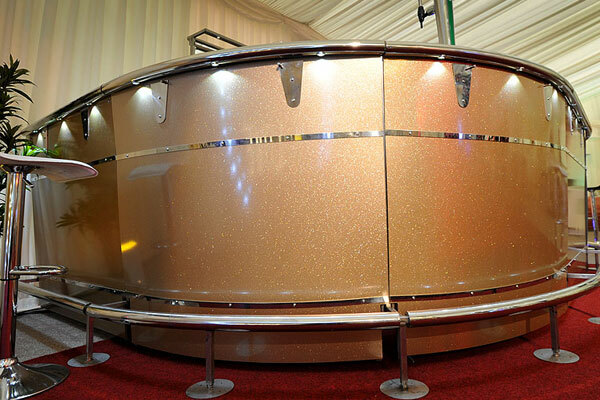 The gold panels look fabulous with their glitter-style finish, and you can be sure that your gold mobile bar will be the centrepiece and focal point of your special occasion. Our gold mobile bars for hire are modular bars and so, to a certain extent, you are able to customise the shape and size of your bar according to the available space at your venue and also the number of guests you are expecting. It might be that you want a circular gold bar or simply a straight line gold bar or that you are looking for more of an oval gold bar hire design – in which case, Event Hire UK can help. We offer a set up and dismantle service for our gold mobile bars, enabling you to relax, safe in the knowledge that your event mobile bar hire requirements are well taken care of, allowing you to concentrate on other areas of your event. Gold mobile bar hire has never been simpler than with Event Hire UK – contact the temporary bar hire specialists and furniture hire experts today and we’ll be delighted to provide you with a customised quote based on your specific requirements.